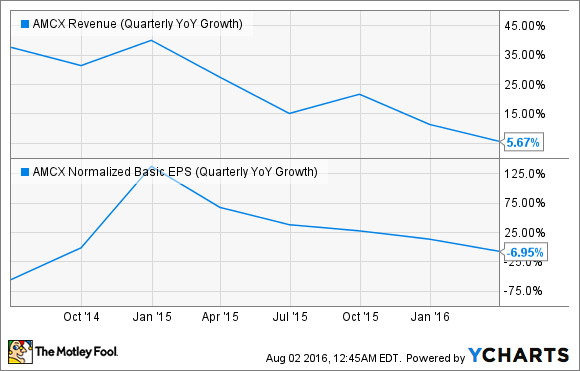 Earnings Preview: Can AMC Networks, Inc. Turn Things Around? The media production powerhouse has not been reporting fantastic growth numbers lately. AMC had high hopes for Preacher. Image source: AMC Networks. AMC Networks (NASDAQ:AMCX) is slated to report second-quarter results on Thursday morning. 2016 has not been kind to the media producer so far; share prices have fallen 26% year to date and 15% since the first-quarter report. Could this business update snap that terrible trend? The first quarter was held back by a drought of new titles. That's the nature of the beast, as the months of late winter and early spring are not seen as prime launchpads for new media franchises. That changed in the second quarter. In the first-quarter earnings call, AMC CEO Josh Sapan held out great hopes for three new titles. Spy drama miniseries The Night Manager, starring Hugh Laurie and Tom Hiddleston, has met with critical acclaim and high viewer interest. Strong word of mouth led to 1.6 million viewers for the premiere episode in the first three days, as a large portion of the eventual viewers decided to fire up their DVR recordings. Preacher did even better, launching to 3.8 million live-plus-three-days viewers. The comic book adaptation, directed by Breaking Bad alum Sam Catlin and executive-produced by comedy guru Seth Rogen, also drew strong reviews from both critics and fans. To put the viewership numbers into perspective, Preacher and The Night Manager held their own among cable shows. AMC's own The Walking Dead drew 9.5 million viewers on average last season and HBO drama Game of Thrones held second place with 5.4 million average viewers. The third potential franchise starter, David Schwimmer vehicle Feed the Beast, was not an immediate hit. With less than 400,000 viewers, the premiere episode was the 73rd most watched cable show on June 7. That's somewhere between the 11 a.m. and 12 p.m. editions of Sportscenter, and hardly a smash hit. The few viewers who did catch that showing gave Feed the Beast a lukewarm grade on Rotten Tomatoes, and critics absolutely loathed its "predictable plotting" and "unlikable characters." So the prepared launch slate had its share of real hits but didn't quite manage to fire on all cylinders. AMCX Revenue (Quarterly YOY Growth) data by YCharts. AMC is not in the habit of providing firm guidance for the next quarter or fiscal year. Instead, CFO Sean Sullivan painted the second quarter in broad strokes, leaving lots of room for interpretation. "The timing and amount of our original programming lineup is quite favorable in comparison to the prior year," Sullivan said. "As a result, we expect a significant sequential increase in the advertising growth rate. We anticipate that the second quarter will be our strongest quarter of the year in terms of year-over-year growth in advertising revenue." Distribution sales should be consistent with the growth seen in the first quarter, where the segment's revenue rose 11% year over year. International sales are seen holding steady near the year-ago result. Putting these pieces together, AMC appears to be aiming at roughly 13% total sales growth, landing near $680 million. Note that this estimate includes lots of moving parts, and I wouldn't be surprised to see the final tally falling far afield from the centerpoint. AMC has delivered revenue surprises to the upside in each of the last 13 quarters, for what it's worth. AMC Networks CEO Josh Sapan. Image source: AMC Networks. Sapan also underscored that he isn't managing AMC to hit next-quarter goals, keeping his sights on targets beyond the short-term horizon. Specifically, he is optimizing the business for long-term syndication and international resales of AMC's established hit shows. "We will make decisions for 2017, 2018, and 2019 that are based upon how we see those deals coming in and how much strength we see in the revenue opportunity lines and simply be guided by business," Sapan said. "We believe over time as consumers become more and more familiar with our programming and brands that our audiences will continue to grow overseas," he continued. "And we're quite confident that our strategy is the right one for international growth, especially as we bolster our programming slate and distribute our shows in new markets around the globe." Finally, the studio's biggest hit is becoming a fantastic ad sales machine. Based on the spring's upfront ad pitches, Sapan said he "anticipates significant pricing increases for The Walking Dead." None of this guarantees an end to AMC's sliding share prices, but the zombie hit's solid advertiser interest and a reasonably successful summer slate do add up to a fighting chance.